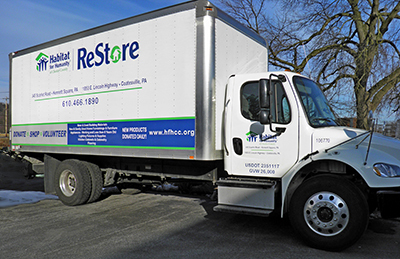 The ReStore sells new and used furniture, appliances, cabinets and building materials and more. Proceeds from the sale of these items help Habitat to build affordable homes in Chester County. All donations are tax-deductible. A receipt for your donation is provided, however, you are responsible for declaring the value of the goods donated. Large or bulk donations requiring two people and a truck are eligible for a free pick up by the Habitat donation team. If scheduling a pickup, we request that donations are located on the first floor or ground level of your home with no more than two or three steps. Smaller donations or those already having transport can be brought to the ReStore. The Caln ReStore is open to donation drop offs Monday to Saturday from 10am to 5pm. ReStore drivers and staff will make the final determination on all donations. For additional information read below or leave a message on our donation hotline at 610-466-1890 and someone will return your call. If you are ready to schedule a pickup for your gently-used items and are already familiar with our guidelines, please use our online form to begin arranging your donation. Please keep in mind that our pickup schedule can be booking anywhere from 1-3 weeks out, depending upon the time of year and your location. If you are not familiar with our guidelines, please continue reading for additional information. All items must be clean, free of rips, stains, pet odor and excessive wear, and must be in sellable condition. Depending upon inventory at any given time, we may not be able to accept certain items. We retain the right to decline donations due to safety concerns, facility limitations, marketability, etc. All donations are ultimately accepted or rejected at the discretion of the ReStore team. chemicals – household cleaning supplies, lawn chemicals, bug sprays, automobile fluids, etc. If you have a question, please feel free to leave a message on our donation hotline, 610-466-1890, and we will return your call as quickly as possible. Habitat for Humanity’s ReStore accepts donations of gently used, reusable home improvement and building materials. Donations are tax-deductible!